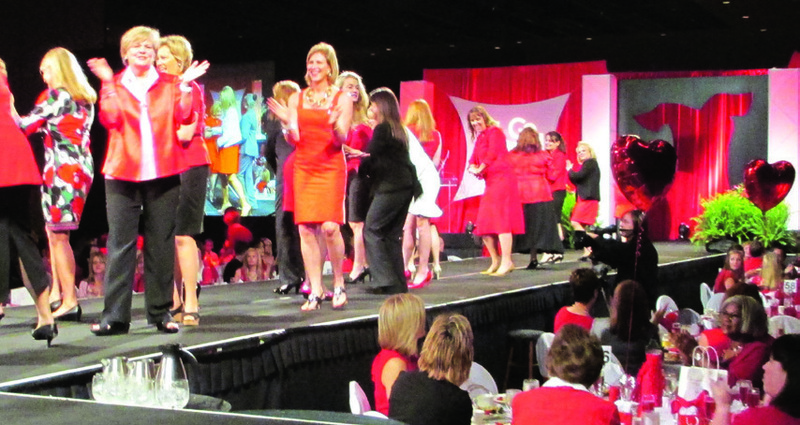 LOUISVILLE This year marked the 10th anniversary of the American Heart Association’s Go Red for Women Luncheon, which took place Friday, May 17, 2013, at the Kentucky International Convention Center. The program’s mission is to reduce heart disease in women and educate and empower women to make healthy choices and know their numbers, including cholesterol level, blood pressure, and body mass index. Since Go Red began 10 years ago, 21% fewer women are dying of heart disease and 23% more are aware that heart disease is the number one killer of women. Approximately 900 women attended the event, which featured health screenings, wellness booths, and a survivor fashion show. Norton Heart Care sponsored the event because their mission is closely aligned with that of Go Red for Women. Janet Smith, MD, medical director of Norton Women’s Heart & Vascular Center, says her goals are to identify and impact – identify risk factors and impact women’s health in a positive manner. One in every two women has some form of cardiovascular disease, and Kentucky’s high rates of smoking and obesity compound matters. Smith says Norton provides heart risk assessments to educate women about their risk factors and point them towards services when necessary. Other services include group classes and one-on-one counseling on a healthy diet, the Circle of Hearts – a free monthly education series, and the Norton Weight Loss Center. Charlotte Ipsan, RNC, MSN, NNP-BC, is the president of Norton Women’s and Kosair Children’s Hospital. She says the partnership with Go Red is a natural extension of the services they already provide for women. “We do more deliveries than anyone in the state on our St. Matthews campus … well over 5,000 deliveries a year. There are so many cardiovascular risks associated with pregnancy,” says Ipsan. Those risks include: preeclampsia, gestational diabetes, pregnancy-induced hypertension, and babies small for gestational age, which doubles the risk for subsequent heart disease within the next five to 15 years. Ipsan spoke to the Go Red for Women Luncheon audience about the obligation women have to help educate each other. “It really is our goal to take control of this and empower women to take their health to heart … We have to be open to listen and we have to be willing to do something about it,” says Ipsan. The Norton Women’s Heart & Vascular Center is located on the Norton Suburban Hospital campus, which is currently being transformed into the Norton Women’s and Kosair Children’s Hospital, a $90 million construction project that will add 131,000 additional square feet of clinical space dedicated to women’s services.